December 2, 2014 (Wortham, Texas) – Early registration is now open for the 2015 AMA Womens Cup at Freestone Raceway from March 16th through March 21st. If you were wondering what to get that special racer in your family, here is a “stocking stuffer” that will light up their faces. The AMA Womens Cup is running in conjunction with the 5th Annual James Stewart AMA Spring Championship and will be featured along with the WMX Championship at Freestone Raceway. The AMA Womens Cup will offer female riders classes in 10 different classes including 51cc, 65cc, 85cc, Supermini, Schoolgirl, Collegegirl, Womens Open and Womens Vet along with the WMX. Four of the ten (10) classes (Class #4 – Girls Jr (9-13); #5 – Girls Sr (12-16); #8 – Womens (14+) and #9 – WMX 14+) are also considered as part of the Spring Championship. When doing pre-registration, these four classes will be under the AMA Spring Championship. 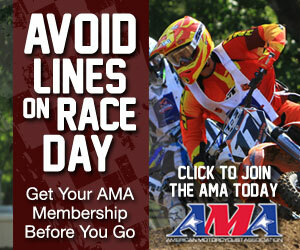 The other six classes will pre-register under the AMA Womens Cup. Riders who compete in the Womens Cup will also be able to compete in the basic Spring Championship classes. New for 2015, an additional practice will be offered on Monday, March 16th. This will allow riders to adapt to the track before Tuesday traditional Timed Practice. On Tuesday, March 17th Time Practice will be conducted. Every rider will get their gate pick for their 1st moto based on their lap times from Timed Practice. Starting on Wednesday, March 18th through the 21st, the racing will begin. Each class will be battling for championships in a two-moto format. Every class will also receive sight laps before their 1st and 2nd moto’s. As part of the Spring Championship, riders who win championships in the four classes (Girls Jr, Girls Sr, Womens 14+ and WMX 14+) will also be invited to attend the James Stewart Champions Ride Day in Haines City, Florida in November 2015. All pre-registration for all classes will be at www.FreestoneMX.com. This entry was posted in News and tagged Registration. Bookmark the permalink.